CPAP motor- The CPAP motor is basically a small compressor. It draws in room temperature air and gently pressurizes it to deliver the perfect amount of air pressure that you need to clear your obstruction. The air intake portion of the machine has a replaceable filter that screens out particulates and impurities. Most newer CPAP machines also have a small water tank that, when turned on, heats up the water to provide moisture to the air you breath in. These built-in humidifiers are ideal for people living in dry or arid climates and those that frequently wake with dry mouth, throat, or nasal cavities. CPAP motors are extremely quiet and barely register above a whisper. CPAP Hoses- The hose is simply the delivery device that transports the pressurized air from the motor to the wearer's mask. While most hoses are 6 feet in length, the diameter of the hoses can be different depending on the machine that one uses. Most hoses are now heated to reduce water condensation accumulation caused by the humidifiers. CPAP Mask- CPAP masks come in all shapes and sizes because not every individual will feel comfortable wearing the same masks as others. While sizes and shapes may vary to fit different shaped faces, there are typically three mask type variations to choose from: nasal pillows, nasal masks, and full face masks. Finding the right mask for your personal level of comfort is the most important part of CPAP compliance. For more information about the various mask types click here. The first step in getting CPAP therapy is to have a sleep study (polysomnogram) performed at a sleep clinic. The results of a sleep study will inform your sleep specialist as to the severity of your condition and best treatment options. If a CPAP machine is determined to be the best option, you will likely have to have a follow-up sleep titration study in which you will sleep at a sleep clinic overnight while wearing various CPAP masks and using a few different machines that will be specifically calibrated to the air pressure needed to clear your airway blockage without causing any disturbance or discomfort to your sleep. 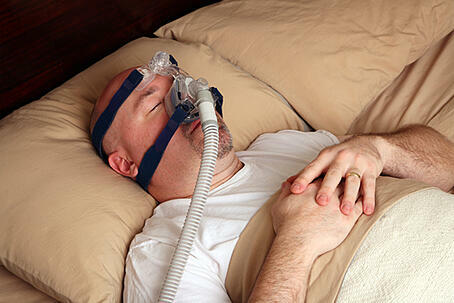 You may also qualify to have a Home Sleep Test (HST) performed to determine the severity of your sleep apnea. Home sleep tests are issued to patients who, through a pre-screening process, are more than likely to have obstructive sleep apnea and simply need to determine the severity. HST's are more affordable than polysomnograms, but don't have as many capabilities. For a break-down on the differences between the two tests click here. Elimination of snoring and breathing obstructions. Improvement in quality of nightly sleep. Prevention or reversal of serious health conditions such as cardiovascular diseases and stroke. Lower blood pressure both during the day and at night. Increased alertness during the day. Significant decrease of daytime drowsiness.